Power Wash Brick House Stucco NJ Middlesex Somerset Union - A-1 Spotless Inc.
Home exteriors of brick and stucco are durable and attractive. Since they are textured materials, dust, dirt and organic staining from insects, mildew and algae can make a beautiful home look dull over time. Power wash brick house or stucco wall. 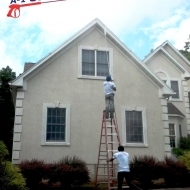 A-1 Spotless Inc. are experts at power washing brick and stucco, and have served customers throughout New Jersey and the Tri-State area. Since 1989, homeowners like you have trusted our team of professionals to maintain their properties. We are reliable, we have professional equipment, and we’ll take the utmost care of your home and property. Proper preparation is important before power washing brick. We’ll inspect the mortar joints between bricks and advise you of damage that should be repaired before cleaning. Our cleaning solutions are safe and applied correctly. Older stucco surfaces can begin to show wear over time and separate from the house. 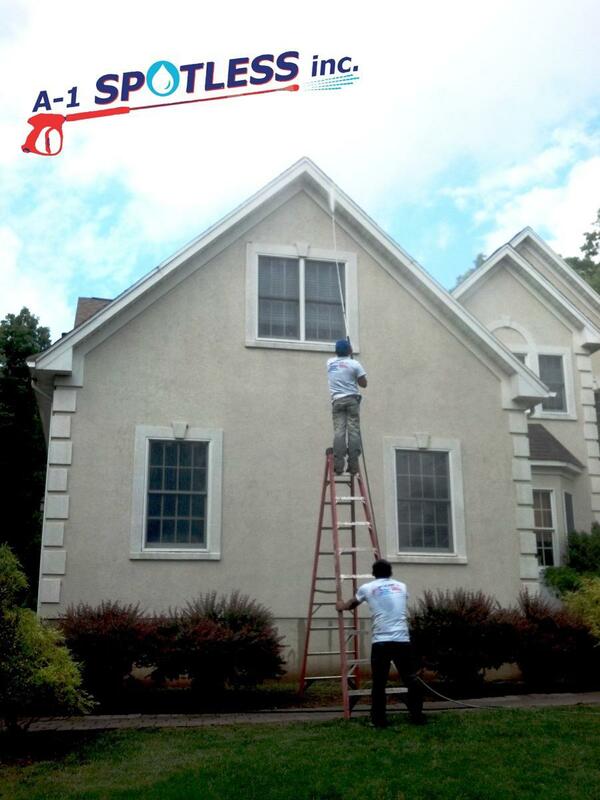 Before pressure washing stucco, we’ll advise you of weak or damaged areas that require repair. Our team is trained and experienced. We’ll keep the job site clean. We’re fully licensed and insured, and commit to doing the job right within the agreed timeframe. Let us tackle power washing brick and stucco, or cleaning your roof, gutters, vinyl siding, patio, deck, driveway, sidewalk, etc. We can also help you with handyman services, painting and snow removal. No job is too small. For reliable pressure washing services done right the first time, call A-1 Spotless Inc. today: (908) 647-9274.